The news has been making the rounds in publications large and small. For me, it was a *smacks self in forehead* moment. When I was trying to finish high school in the spring of 1970 while keeping my secret pregnancy, uh…welll…secret. The last thing I could imagine was somehow keeping my baby and going off to college. Adoptive parents have also been found to have higher incomes. Another forehead smack. Of course the intent of this report is not to surprise us. It’s to gather data. 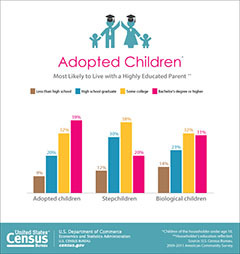 If you’d like to read more adoption stats, you can see the full report here. Mostly, I think of the personal angle rather than the statistics when I see headlines like the one above. I think of a woman reading the paper over her morning coffee. A woman who gave away a child, believing that someone else could provide a better life. I think of the ache she might have in the pit of her stomach or the pull in her heart. This entry was posted in 1970, adoptees, adoption, adoptive parents, birthmother, birthmothers, U.S. Census, Uncategorized and tagged 1970, adoptees, adoption, adoption statistics, education, income, secret pregnancy, U.S. Census on April 25, 2014 by declemen.